When it comes to kitchens, space and functionality are big factors for many consumers. Having enough space to house all of your appliances, as well as using the space well can make all the difference, especially in big households where the kitchen often becomes a hive of activity. As a result, integrated appliances, including integrated dishwashers, have become increasingly popular over recent years. While generally a more expensive option, integrated dishwashers are perfect for those who are after a particular aesthetic, or for those who may not have a lot of room to work with, as they are made to fit seamlessly into your kitchen. With plenty of brands offering both semi and fully integrated dishwashers, narrowing down which could be the best ‘fit’ for your kitchen can quickly become a big ask, with plenty of features and functions adding to the complexity of the decision. Read on as we review a selection of integrated dishwashers from some of the leading brands in the market. A regular within the kitchen appliance scene, German manufacturer Bosch has a number of integrated models for customers to choose from. Available in all its ‘Serie’ ranges, Bosch gives households options to suit all budgets and needs, with each model coming with a range of functions and features to make life a bit easier. Bosch’s starter model, the Serie 2, comes with a three-and-a-half star energy-efficiency rating and a four star water rating, in addition to a two year warranty. It also comes with multiple wash modes, including half load, intensive mode – for those really tough cooking stains – as well as a quick wash for those who need clean dishes in a hurry. Other features include LoadSensor technology to optimise water usage, as well as DosageAssist, which maximises the effectiveness of detergent tablets. 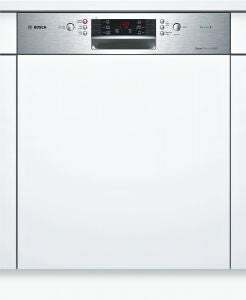 Other Bosch models, such as the Serie 8, include more features and functions for larger households to take advantage of, including the likes of MachineCare, which apparently helps in removing grime and limescale build-up, as well as HeatExchanger, which uses the residual heat from the main wash cycle to help dry dishes, reducing energy usage. Bosch dishwashers also include features such as child locks, VarioDrawers for extra storage, as well as quiet mode for those night time washes. The Polinox inner tub is also durable, odourless and rust-free, meaning that there won’t be any surprises left behind when you’ve finished washing either. While it may not offer a ‘traditional’ integrated dishwasher, Fisher & Paykel does provide an integrated DishDrawer model, which may prove to be a great option for households pressed for space, or smaller households that don’t require a full-sized dishwasher. Available in both single and double drawer varieties, the DishDrawer range includes features such as child locks, delayed start options and adjustable racks for easier washes, with both models scoring three-and-a-half stars for energy efficiency, while scoring four-and-a-half stars for water efficiency. Additionally, Fisher & Paykel has included a knock-to-pause feature, which allows users to pause the dishwasher by simply knocking once on the front – a handy feature for busy households. But make sure the kids don’t keep pausing the cycle! The DishDrawer models come with a wide variety of wash cycles and programs, including a delicate wash, an eco-friendly wash, as well as quick and sanitise options. The double drawer model also allows households to operate two independent washes at the same time, meaning you can wash your delicate glasses while operating a power wash for dirty pots and pans without fear of damaging either. Chinese manufacturer Midea offers Australians both semi and fully integrated dishwashers, catering for households regardless of their current aesthetic. All Midea integrated models are 60cm, meaning those with space restrictions may not find a suitable model, but for those with plenty of space to work with, Midea dishwashers may be worthwhile looking into, with plenty of features and functions available in each model. Some of the features include a LED screen display, as well as touch controls and a door light for handy night-time operation. Each model also contains dual turbo fan technology for an easier drying phase, as well as an adjustable upper basket for those larger dinner plates and pans. Added extras include a third layer cutlery tray for those larger utensils, as well as a wide variety of settings and wash modes to help keep your dishes clean and ready for dinner. Offering one the largest range of integrated models, Smeg will have a dishwasher for you, with both semi and fully integrated models coming in a number of varieties. Smeg’s models come in 45cm and 60cm sizes, helping households find the perfect spot for their dishwasher. For those after a semi-integrated model, Smeg has a range of models available, including the brand’s Diamond Series, which operates with a six star water rating and four star energy rating. Additionally, the Diamond model comes with an LCD display, internal LED lighting, adjustable baskets as well as a 24hour delay timer. Smeg models may not have the washing program variety as some other brands, but may be worth looking into if you’re after a dishwasher that’s easy to use. Smeg’s fully integrated range is more expansive than the semi-integrated line, with a range of 45cm and 60cm varieties available. Smeg’s starting model includes a five star water efficiency rating, as well as a four star energy rating, along with removable trays and a variety of specific wash programs and settings. Additionally, consumers can add the automatic door opening option, which opens the door at the end of the wash to remind you to empty the dishwasher, handy for those who forget. Similarly to the semi-integrated line, Smeg offers a Dimond Series, with added extras including a higher water star rating, additional quick wash programs as well as comforts such as LED lighting and half load capabilities. 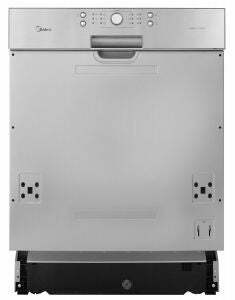 For those after a drawer design, Smeg also has you covered, with its Horizontal dishwasher also available for households. The Horizontal dishwasher contains six collapsible dish racks, allowing for plenty of loading options, as well as the capacity to wash oven racks and trays. Smeg also provides a delay start along with a self-cleaning filter with the Horizontal model, making it easier for households to use and maintain. 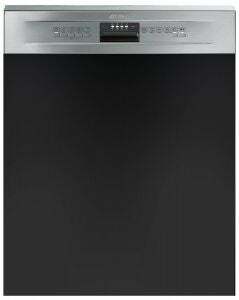 Is an integrated dishwasher worth the money? With space often at a premium when it comes to the kitchen, integrated appliances are certainly a handy option to help keep your kitchen clutter free, while simultaneously impressing house guests. While an expensive alternative, integrated models may be worth investigating if price isn’t a concern. 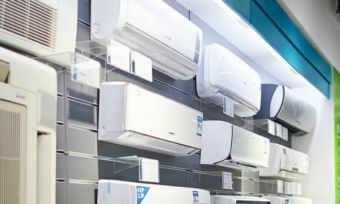 As with most appliances, what you decide to go with will come down to personal preference and your individual needs. How much space you have in your kitchen, how regularly you wash dishes and how much you’re willing to spend will all impact on your decision. As a result, it’s always best to do your own research before purchasing a dishwasher, as you may find a better fit for your kitchen further down the line. To help you make an informed decision, head on over to our dishwasher reviews and ratings to find out which brands are popular amongst Australian households.